The Avery Weigh-Tronix PS1000 has been renamed to the Brecknell PS1000. The Weigh-Tronix PS1000 has a capacity of 1000lbs and provides consistent accuracy within 0.1% and comes equipped with an indicator for fast digital read out. 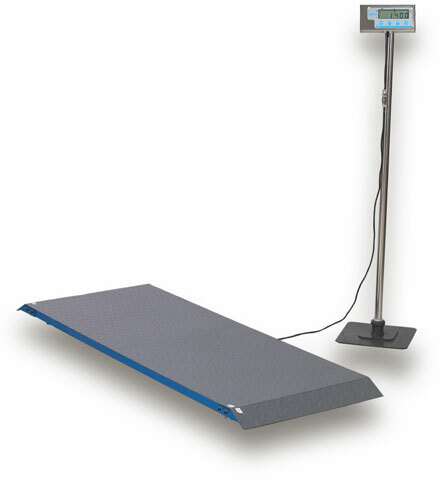 It is portable, weighing only 60 lbs, two easy access carry handles makes this scale convenient to relocate. No need for ramps or recessed floors, as this unit comes with ramped ends. There are no installation costs and no moving parts that require maintenance or adjustment. The Weigh-Tronix PS1000 accomplishes a multitude of weighing jobs: livestock, pets, feed carts, bulk containers, shipping and receiving and more. 500kg x 0.2kg / 1000 x 0.5lb, mild steel. Operates on four AAA batteries or US AC adapter (both included). Includes a ABS plastic housed indicator with black plastic bracket for wall or stand mounting. Does not include stand for indicator.